← Glazed Turkey Cutlets; Mind Your Step! Try to get a variety of of forest or wild mushrooms for this rather than the white button. Crimini will work, but the flavor will have more depth with 2 or 3 types pf mushrooms. I used crimini, oyster and chanterelle, with sliced crimini for garnish. Clean mushrooms (using brush). Pick out 3 – 4 nice mushrooms for garnish and slice. Roughly chop the rest. Clean leeks and finely slice. Mince garlic. Heat 2 tsp butter in medium saucepan. Add leeks, garlic and mushrooms and sauté for 3 – 5 minutes. Add stock, herbs, cover and reduce heat. Simmer for 15 minutes. When soup is done put solids in blender. Add enough of the broth to puree easily. I used all but 1/3 cup of the stock. Add milk and sherry. Check consistency and add more stock if needed. Gently heat just until soup is hot. 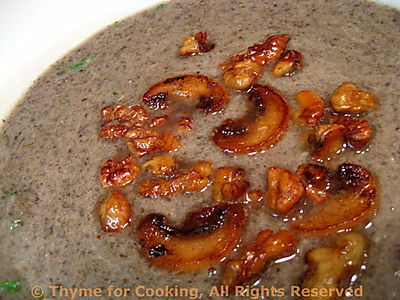 Ladle into bowl, garnish with sliced mushrooms and walnuts. Serve. The garnish: Heat 2 tsp butter in a nonstick skillet. Add the sliced mushrooms and walnuts and sauté until very brown and the mushrooms start to get crisp around the edges. In addition to the above, for the week of October 17 we have Salmon Baked in Phyllo, Chicken Savoyarde, Salami Pizza, Spaghetti Timbale, Glazed Pork Chops, Butternut Squash with Bacon and Sage…. Lovely soup. Next weeks menu sounds amazing…can’t wait for salmon in phyllo. Just thinking of you and your mari and the girl dogs and hoping the preparation for your move into your new digs is going well. Courage! Katie I love cream of mushroom soup, and I am always looking for different versions of it to try! Oh Katie walnuts and mushrooms! I just sauted up a batch of mushrooms to be creative with. Adding walnuts to them will be excellent for one meal with them. This is awesome, just love it, delicious and fragrant too! yummmy! walnuts, mushrooms and cream? Sounds like a satisfying bowl of goodness. I love mushrooms going to keep this recipe for winter, its a bit hot in South Africa to have soup now. That soup looks amazing. I am going to try it with all the great mushrooms we have out now. Thanks, everyone. I hope you enjoy the soup. With all the gorgeous mushrooms… and having just moved to the heart of walnut country it seemed a natural. But maybe next spring in SA! That mushroom soup looks amazing! I like the fried mushroom garnish.